At a fundamental level, 13 Assassins dramatically illustrates the deadly nature of conflicting political loyalties. Based on Eiichi Kudo’s The Thirteen Assassins (1963), director Takashi Miike and writer Daisuke Tengan take some very traditional Japanese beliefs about bushido and contextualize them with ideas about subjectivity and individual agency. The plot centers around the pending appointment of Lord Naritsugu (Gorô Inagaki) to the powerful Shogunate Council. However, Naritsugu’s intense fascination with death coupled with his pathology for killing compel him to arbitrarily (and often clumsily) kill commoners and nobility alike. Because of their oath, his clannish samurai protectors are forced to defend his bloodlust, but other noble members, the powerful Sir Doi (Mikijiro Hira) in particular, are greatly disturbed and politically embarrassed by his behavior, so a plot to eliminate Naritsugu is hatched. Miike and Tengan’s narrative illustrates how local alliances work within the broader formations of centralized power. In this feudal class system, a highly personalized arrangement of identity-politics labors to serve the aristocracy. 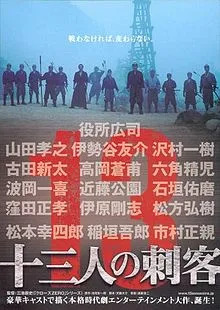 Here, the filmmakers develop many ironies, but the film’s main theme illustrates how traditional civic relationships are often arranged fallaciously, for the appeal to tradition that allows Naritsugu ample clannish protection also permits Sir Doi to persuade a Shogunate samurai, Shinzaemon (Koji Yakusho), to see how such arrangements work against virtue and justice. Miike has long been known as an evangelist of experimentalism, a tireless ironist who varies his narrative work and directorial choices, often working his preoccupation for hematology into his films (with mixed results). In Shinzaemon, he chooses as his central heroic figure an ethical man who embodies the tenets of the bushido. As a widower and a man of conscience, Shinzaemon is a bit of a loner who is guided by a deep sense of personal ethics, a man who understands the boundaries between service and servitude. Interestingly, the film focuses on how a loyal samurai in Shinzaemon is persuaded to commit acts of heresy. In this era of relative peace, the samurai have become idle warriors, and a seemingly quiet yet restless Shinzaemon understands that obedience to political policy and social tradition prohibits the creation of other kinds of knowledge and experiences. In this sense, he is not afraid to transgress social custom and transcend conventional wisdom because he believes in the agency and authority of his own reasoning. And because he is a restless professional who is unafraid to gamble, he commits to killing Naritsugu once he witnesses the after-effects of one of Naritsugu’s barbarous transgressions. As a result, Shinzaemon recruits 11 other samurai (a very late addition is something more than a samurai) and commands his group with generosity and tempered authority, as they prepare to lure Naritsugu into their complicated trap. Miike and Tengan rest their story on familiar conventions–with customary scenes introducing the warriors, renewing old rivalries, and executing interesting but improbable stratagems. There are discussions about honor, loyalty, death, and scenes demonstrating the social importance of the samurai. Miike, for the most part, gives the narrative a traditional authority by efficiently working from commonplaces. He uses set pieces because they allow him to weave modern horror tropes into older conventions, creating his own baroque style. Beyond these artistic choices, 13 Assassins develops enough philosophical and rhetorical dynamics to hold interest. The film questions the idea of absolute loyalty by illustrating how social obedience to a rigid political system is often incompatible with developing individual virtue. Just as important, this obedience fails to allow the samurai to confront social justice issues, such as protecting the weak and innocent. In this respect, Miike crafts many scenes in which an aristocratic political structure is at odds with personal ethics, and undergirding these scenes is the pointed irony of worthy servants–trapped by their martial loyalties and social bonds–serving an unworthy master. Though the film delineates social, cultural and political boundaries clearly, the antagonist’s motivations are less clear. As we watch Naritsugu patiently execute bound women and children in front of his men, we are unsure if his overtly cruel acts are the result of dementia or a severe demonstration of political power. At every turn, Lord Naritsugu exercises his moral authority to govern, and his authority raises many problems with a social code that allows a leader to manipulate his followers into defending his illicit behavior. For instance, after he is done killing his victims, he reminds his closest advisers about their bushido code, arguing that their loyalty to upholding his authority is far more important than serving their instincts to protect the innocent. As we witness his transgressions, we wonder why an unseen Shogun would fast-track his half-brother to a powerful council, for one would imagine that even clannish manners would have something to say about murderous family members. But the film does smartly offer some glimpses into Naritsugu’s devilish, homicidal identity, one shaped by his stature, handsomeness, boyish smile, and sophistry. Although these behavioral characteristics may serve the surface-oriented nature of nepotistic politics, they do not offer substantive psychological insight. Because of this shortcoming, we are left to deduce Naritsugu’s actions a few ways: one, he is more symbolic than flesh, emblematic of a fallaciously-arranged political system that compels the samurai to commit self-defeating acts; two, he is a pathological killer, or some sort of devil or nihilist, one who finds pleasure in destroying. Either way, his pathology creates conflictive differences between his loyal samurai and Shinzaemon’s heretics, and the film seems to argue that a political system focused on upholding aristocratic traditions is too narcissistic in its composition and too trapped by its own political ambitions to use its moral authority to help others. Though we’re unsure about the origins of his bloodlust, the despot-in-the-making Naritsugu is distinctly drawn, and the filmmakers create assassins who are mostly unique in their composition; however, the film does develop one puzzling oddity in Koyata Kiga (Yūsuke Iseya). Found deep in the mountains, trapped in a basket, hanging high from a tree, this wily woodsman is stumbled upon by Shinzaemon and his men while shortcutting through a dense forest. Kiga’s tag-along presence, at first, seems like an ode to Kikuchiyo (Toshiro Mifune) of The Seven Samurai, but he becomes more than the fiery yet dislocated impostor that Kikuchiyo is. Though the lowly but spirited Kiga is often seen interacting with Shinrouko (Takayuki Yamada) as his animus, he emerges as the antithetical counterpart to the well-manicured Naritsugu. However, the story of his banishment (for putting his hands on his boss’s daughter) veers the narrative into the supernatural. In one evening scene, for instance, Kiga daydreams, and we witness his beloved consuming a fleshy substance–perhaps cannibalizing her fetus. This odd moment coupled with Kiga’s seemingly improbable battlefield prowess (his lethal sling seems to miss only once), sudden impalement (by Naritsugu’s flying sword! ), execution by the stalwart Hanbei (Masachika Ichimura)–and resurrection especially–suggest a natural supernaturalism at work in the narrative. In Japanese culture, mountains often serve as existential, liminal planes, places where ancestors, demons, and the living dwell together. Because demons are common in Japanese mythology (when asked, Kiga denies he is a ghost), Miike contextualizes this feudal land as a haunted place where a fear of ghosts and goblins is displaced by a fear of a murderous nobleman, one who willingly breaks sacred codes of trust to victimize his vassals. In one sense, the impish, disfigured Kiga (with his priceless, thorny comments about the uselessness of the samurai) serves as simple comic relief. More deeply, however, his presence develops the argument that a demon (or less likely, a shapeshifting kitsune) is far less menacing and more moral than an ignoble Lord, for Kiga’s martial help is critical to defeating Naritsugu’s endless retinue of bodyguards as he helps a group of assassins invoke a rebellion to restore order. 13 Assassins develops this irony with ideas of individual choice and social justice. For instance, after he is stabbed by Shinzaemon, Naritsugu writhes in muddy agony, yet, as he is about to die, he expresses his sincere gratitude to his executioner. Though Naritsugu’s grimy death spares the land from his homicidal despotism, Shinzaemon dies willingly, for he understands the severity of his crimes, so he allows Naritsugu to stab him lethally before beheading him. In this respect, their deaths allow for vice to be punished and virtue to triumph. After the battle concludes, a bouncy and resurrected Kiga appears to a surprised Shinrouko, Shinzaemon’s surviving nephew, and he speaks about returning to the forest to join his beloved. Though Shinrouku contemplates life beyond the samurai, we are unsure of his intentions. Philosophically, Miike and Tengan seem to argue that the samurai’s deeply ingrained code of obedience belongs to the past, for Shinzaemon’s death releases his nephew to contemplate more independent ways of living while Kiga spurns civic entanglements to return to nature. Clearly, both are free to choose alternative ways of living, and the film empathizes with their circumstances. Within the conflictual differences between the orthodoxy of Hanbei and Shinzaemon’s heresy, the film suggests that virtue can be found in acts of qualified heresy (from hairesis, meaning “choice”) when one veers from upholding and embodying a master’s conviction to defending a more individualized position. When Naritsugu uses Hanbei’s head as a kickball, we understand that the Way of the Samurai is one of shackled servitude. And when we witness Shinzaemon moving beyond simple obedience into creating an individualized, moral position–choosing to stand and perish in the cleavage between tyranny and freedom–we understand Tengan and Miike’s argument about the supreme importance of personal choice. Furthermore, the film argues quite radically that the bushido values of honor, benevolence, valor, respect are more effectively embodied and better defended by people who have a strong sense of individual agency, for those who are drawn to more collective constructs become eager despots and willing victims who sacrifice others for their causes. The film consistently indicts a system that compels people to uphold their oaths to a despot and die on behalf of tyranny, but the film also offers a resolve: although group efforts often pressure people into surrendering their personal virtue, individuals can reaffirm their spirit and retain their humanity by interpreting the bushido less as a collectivist code of social conviction (and a code of death) and more as a personal code for individual responsibility, reflection, and action. Posted in Side Shots Film Blog and tagged 13 Assassins, Daisuke Tengan, Takashi Miike. Bookmark the permalink. Trackbacks are closed, but you can post a comment.